For other places with the same name, see Devonport (disambiguation). Devonport is the third largest city in the state of Tasmania, Australia. Often referred to as the gateway to Tasmania, being the arrival port of the daily Bass Strait ferry service from the mainland. With a population of around 25,000 people, Devonport is really just a large town. The main part of the town, West Devonport is largely situated between the Don River to the West and Mersey River to the East. The other part of the town, East Devonport is situated directly across the Mersey River from the town centre. Devonport boasts a number of pleasant beaches, natural bush reserves and striking headlands including the Mersey Bluff with its lighthouse sitting atop. Devonport, along with the centers of Ulverstone, Latrobe, Wynyard and Burnie is part of Tasmania’s beautiful North West or Cradle Coast region. Devonport is the closest point of arrival to the World Heritage listed Cradle Mountain-Lake St. Clair National Park, only around one hours drive away from the jewel in the crown of the Tasmanian Wilderness. Devonport is the Tasmanian arrival port for the Spirit of Tasmania  passenger ferries from the mainland. 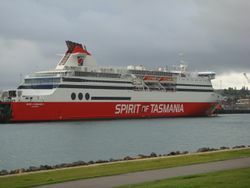 The Spirit of Tasmania I and Spirit of Tasmania II travel the Melbourne - Devonport route providing an overnight service in both directions every day of the year. The vessels depart at 8PM and arrive the following morning at 7AM. During peak periods there are additional daytime crossings, departing at 9AM and arriving the same day at 6PM, and the overnight ferry going from 9PM until 6AM. The ferry terminal is in East Devonport, directly across the river from the town centre. Boarding closes 45 minutes before the departure time, and it is not unusual for the ship to be sailing well away from the wharf at the time of scheduled departure. There are restaurants, both buffet and a-la-carte on board. There is a cinema, several bars, and live music during summer crossings. There shop selling essentials, and tourist items. There is a phone which works while at sea, and a ATM which doesn't. Telstra has mobile reception and 3G data is available throughout the ship, even when at sea. No other mobile or data services are available. The vessels have a wide variety of accommodation, these include Cruise Seats, Business Class Seats, Inside 3, 4 Berth Cabin, Porthole 3, 4 Berth Cabin, Inside Twin Cabin, Porthole Twin Cabin and the luxurious Deluxe Cabins. Fares Its cheap to take your car on on board, at $83 per car year around each way. The cost is subsidised by the federal government as part of the national highway budget. Unfortunately you can't send your car unaccompanied, and you will have to buy at least one seat on the ship. A seat usually costing between $120 and $180 depending on the time of year. The cheapest cabin costing between $170 and $280 per person, depending on the time of year each way. More for a twin or deluxe cabin, more for a porthole. It can easily be cheaper to fly than to take the ship, and as a guide a flight and a week of car hire in a small car for a couple usually works out around the same price as a return trip with a car in a twin cabin. Motorbikes cost $45, and bicycles cost $7. However, officially these are only entitled to the subsidised rate if they are your form of transportation. If you can get the bicycles on the car on a bike rack within the standard car length, then you pay no extra for them. The ship docks in East Devonport which is linked by a passenger ferry across the Mersey to the town centre. However it doesn't run as early as the ferry arrives, or as late as the ferry arrives, and not at all on Sunday. The walk around via the road bridge is a long one, and you may need to get a taxi into town. Devonport Airport is 8km (5 miles) from the town centre. This small regional Airport is served by Qantaslink  which flies into and out of the airport up to six times a day, connecting with other flights on the mainland at Tullamarine Airport in Melbourne. Local carrier Tasair  operates passenger and cargo flights to King Island. To get to or from the Airport. A taxi will cost approximately A$20 from the town centre. Taste the Tiers Tours operate buses between the town centre and the airport. Fares start at A$10 per person one way. There are a number of car rental agencies with an office at the Airport. The city centre of Devonport is concentrated within walking distance. So it makes sense to get around on foot. If your apartment or hotel is not close to the city center, a taxi will come and pick you up. Remember Devonport is, beside the ferry terminus, a small country town. It is a fair walk from the ferry terminus in East Devonport to downtown in West Davenport. A passenger ferry service operates across the Mersey form the ferry to the town, but does not operate on Sundays. An off-road cycleway follows the waterfront, going up to the lighthouse. However the two sections of cycleway rely on the passenger ferry to connect them, which doesn't run early mornings, late nights, or on Sundays, so on those days East Devonport is inaccessible unless you want to cycle on the road, and take the freeway bridge. Tiagarra Aboriginal Cultural Centre A museum of aboriginal history, with a nature trail that takes you to view natural rock formations that have been mistaken for Aboriginal rock carvings. Don Village and Don River tourist railroad Vintage steam train and pioneer-style museum. Mersey River Cruises  Cruise the calm waters of the Mersey River estuary taking in the unique sights of Devonport and surrounds. Molly Malone's This Irish pub is one of the biggest spots for beer on tap in town. Dinner is served until 8PM and on weekends the bar fills up fast. The ferry brings on a daily basis people to town, and therefore there is a broad variety of apartments, hotels and hostels depending on your budget. When you arrive with the ferry in Devonport you can reserve a room on board the ferry. For weekends and the peak season (December to February) it is recommended to book a room up in advance. The pub Molly Malones has a couple of rooms upstairs starting from $15 per night. One double room with en suite ($50) for the posh backpackers. There is also a backpackers situated behind the old Devonport Hospital, beds start at $13 in a dorm. Other than a few thefts, muggings and car break-ins, crime is rare and you are very safe. This page was last edited on 9 June 2016, at 08:06.